This is the third blog post in our #SGInstitute series, led by our Strategic Advising practice on lessons learned from advising schools, networks, and districts on growth and expansion. Starting a new school or expanding an existing one requires support and action from many different groups of people, including parents, community members, district leaders, and staff. In our recent Strategic Growth Institute (SGI) cohort, participants talked about how hard it is to inspire support and action from these varied stakeholders given the range of perspectives each might have on growth and the limited time organizational leaders have. We heard about the dangers of under-investing in stakeholder engagement, which could result in a program model that does not reflect your community’s needs, an under-enrolled school, or a failed application for expansion. We also heard about the far-reaching benefits of doing stakeholder engagement work well, such as cases where parents and staff not only understand a growth plan but actively shape and champion it. 1. When considering whom to engage, get specific. When we led this exercise with our latest cohort, each participant identified “school staff” as a key group to engage in the growth process. But one SGI participant reflected that the staff-wide culture, level of experience, and comfort with ambiguity at his existing two campuses were very different. Acknowledging and exploring these differences is critical to successful stakeholder engagement, as the different “starting points” might warrant different end goals and different engagement strategies. As you consider your stakeholder groups, ask how you might break groups down into subgroups (e.g., experienced vs. new staff, elementary vs. middle parents, etc.) to better address unique points of view. 2. When defining what the goal is, draft a SMART (specific, measurable, achievable, realistic, and time-bound) goal. Of course, all leaders want all stakeholders to enthusiastically support their growth strategies. In order to effectively rally stakeholders around a change, however, you must have a clear, specific vision for what success looks like. Is it parents of students at an existing campus re-enrolling their children? Is it a percentage of teachers from an existing campus volunteering to help start the new campus? One current SGI participant shared a goal for teacher engagement that she defined amid a recent change in the district’s calendar: “We had to make the change because it was a district mandate. My goal was for teachers to believe that their feelings were heard and that they were supported to make the change. Overall, though, my definition of success was for the change to be rolled out in a way that did not take our overall focus off of instruction during our staff meetings and interactions.” This vision helped the leader plan accordingly and know whether she was on- or off-track. 3. 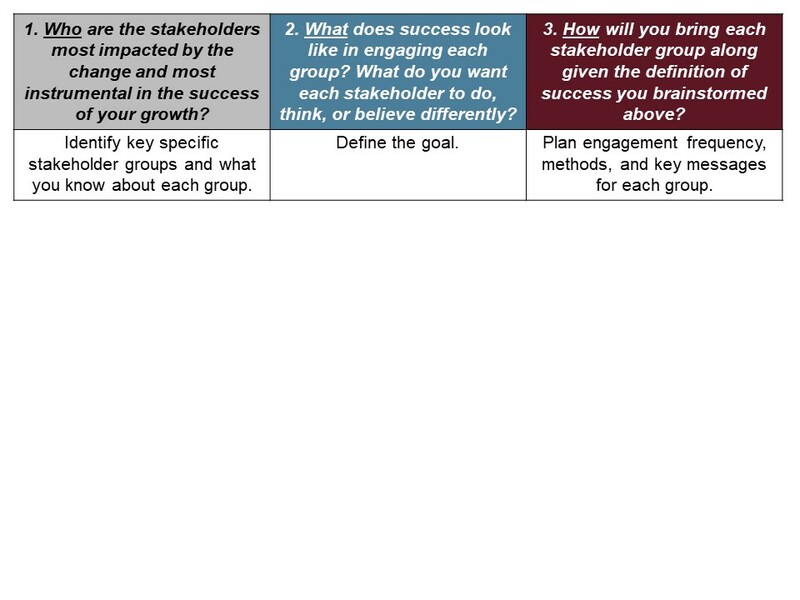 When creating a plan for how to engage stakeholders, think about differentiation. Just like in a classroom, different people have different needs and ways of engaging. Depending on who the stakeholder group is and what your engagement goal for each group is, you may need weekly versus monthly touch points; you may also involve the group in designing what growth should look like instead of informing them of what changes to expect. Another SGI participant reflected on the differentiated approach she took when launching her first campus: Her district leaders were key stakeholders who wanted frequent, one-on-one check-ins about policy, contracts, budget, and enrollment. The same level and topics of engagement would not have been appropriate for the hundreds of parents the leader engaged. Instead, she sent surveys, hosted focus groups, and conducted design sessions with parents to focus on the issues they cared most about, like the mission, vision, and instructional model of the school. Reflecting on our convening conversations, I am reminded how vital it is that organizational leaders know and listen to their communities on a regular basis — not just during phases of growth. I was struck by the robust and tailored plans that our participants are creating, which are informed by their experiences growing up in the communities they’re serving and their long-held relationships with area leaders. Each step of the growth process is made better by deeply knowing their communities. We hope that this tool and the wise words of our SGI participants can support organizational leaders in the challenging yet absolutely critical work of engaging others while planning to expand impact. This entry was posted in Charter Schools, School Leadership, Strategic Planning and tagged #SGInstitute, growth strategy, stakeholder engagement on November 14, 2018 by Lauren Schwartze.